Written by Carla Morris. Media by Kristyn Chapman. Runners, mark your calendars for the annual Panther 5K Road Race to take place at Greenville College on Saturday, October 19. The race begins at 8:30 a.m. on College Avenue near Spruce Street. This marks the third year that RaceMaker Productions will provide Panther 5K runners with professional chip timing. The fee for each participant registering before October 8 is $15. These early registrants will receive long-sleeved road-race t-shirts and gift bags. The fee for participants registering October 8 and after is $20. They will receive shirts and gift bags while supplies last. Awards will be given to top finishers in all age categories and the overall finisher. 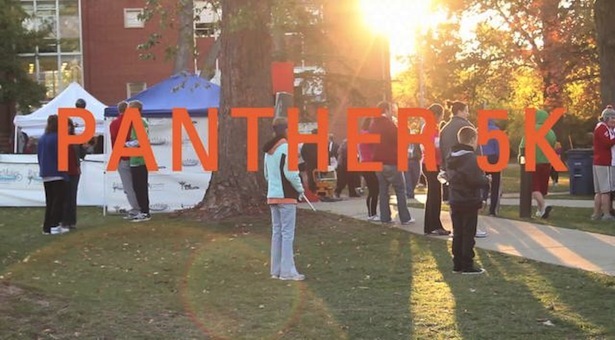 Children seven years and younger are invited to join the Greenville College panther mascot in the Children’s Fun Run on Scott Field at 8:00 a.m. Children ages 8-12 will take their speed to the street at 8:15 a.m. in the College Avenue Dash. The registration fee for the Children’s Fun Run and College Avenue Dash is $5 per participant, which includes a race t-shirt. The winner of the College Avenue Dash will also receive a trophy. To register online for the Panther 5K, Children’s Fun Run, and College Avenue Dash, go to www.greenville.edu/homecoming. Online registrations will be received until 11:59 p.m (CST), Wednesday, October 16. Race participants may also register in person on race day. Registration opens at 6:45 a.m. on Hogue Hall Lawn just off College Avenue. For additional information about the Panther 5K Road Race and other Greenville College Homecoming events, go to www.greenville.edu/homecoming or email your questions to alumni@greenville.edu. You can also call Greenville College’s Director of Alumni Relations Pam Taylor at 618-664-6513.